I am spending way too much time thinking about bears. There are warnings everywhere I look - in the dining room, on the insides of rest room doors and at the entrances to the houses/dorms at Peters Valley Craft Center in New Jersey on the east coast of the United States. I am here in the lush Delaware Water Valley Gap in late August 2008, along with eight other women to study with Takako Ueki, proprietor of Habu - temple of gorgeous yarn. She is teaching "Weaving Light and Air Between Threads", and we want to spend five days weaving these very fine threads, reeling silk, and making yarn from ramie fiber. Truthfully, we'd probably sign up for any course Ms. Ueki offered! The areas where we live for the week are houses from an older era and scattered in a little woodsy village. "Woodsy" is the part that some of my attention goes to more than I'd like. I am no stranger to animals or forest, but in Boston I don't have to think about bears much, in fact, not at all because I'm not a hockey fan. (Boston Bruins...) It's a fifteen to twenty minute walk from my dorm to the dining hall. I sing, I jingle keys, I talk loudly to myself - I've heard that these sounds will let the bears know I'm around and keep them away. I'm pretty sure my singing, all by itself, will keep them away. My house/classmates, Judith and Sharon, have come from Chicago and California. 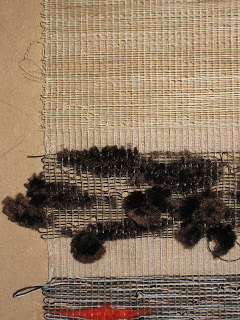 We share a love of weaving, Habu yarns and a healthy respect for bears. Other classmates are from Pennsylvania, Texas, and nearby New Jersey towns. The first thing that one sees upon entering the weaving studio is Takako Ueki setting out her array of Habu yarns and garments made from them. 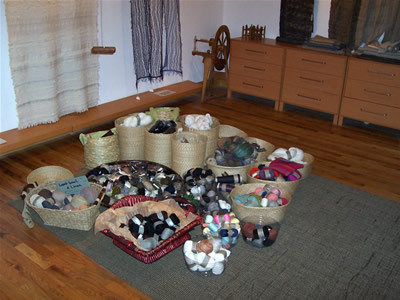 We all have our Habu stories - we describe our first and subsequent visits to the beautiful little yarn shrine on 135th Street in NYC or offer a description of a textile conference where we've encountered those tasty little spools of silk and every other fiber. The stories have an air of intrigue and mystery usually reserved for talk of legends and wonderful monsters that guard treasures - the ones that lurk in the liminal area just out of the presence of humans - Loch Ness, Yeti, The Sirens, Habu Yarns. In the stories, one usually has to travel through a hell, in this case, a part played by New York City - and one arrives at a building that could not possibly house the wondrous Habu. Driven by our quest to see the yarns in person, we persevere. We can't believe that going up in this elevator in this dusty old building will lead us to the treasure we seek. Puzzled, still, when we get off the elevator, we look at the little piece of paper with Habu's address, all the while believing we must've made a mistake - this couldn't possibly be where Habu is...then a door, and opening it, we are rewarded with a little glimpse into yarn heaven, Habu's showroom, with subtly colored weavings and baskets of little yarn packages. We've made it! 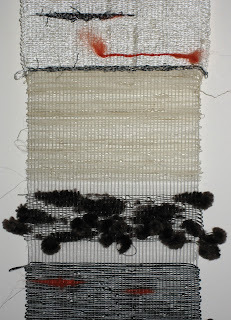 But back at the weaving studio, Takako is taking us on another journey. 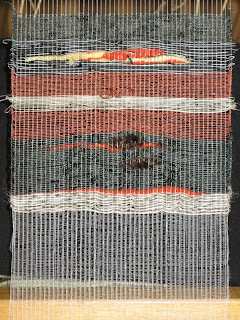 She shows us yarns made from silk at its various stages, pineapple fibers, paper yarns, yarns made from old fishing nets, yarn that includes the little furry fiber from fiddlehead ferns, and on and on. 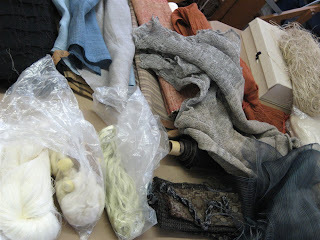 She has fine reeds from Japan and fabrics made from some of the fibers she's brought. We are all happily sated and there's a pleasant anticipation when she shows us the hand tied ramie we'll be making, the silk cocoons from which she'll show us how to reel silk and the spools of fine 21 denier silk we'll use in our weaving. It's all inspirational - she has worked her spell! 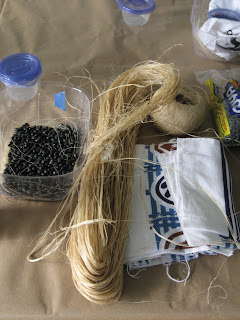 We'll be making our own ramie thread, also called karamushi, to use in our weavings. 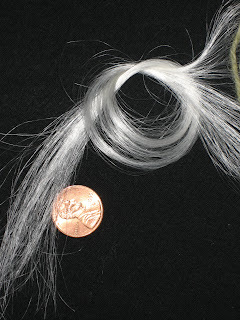 Ramie, a bast fiber of the (non - stinging) nettle family, has a unique look when made into yarn. Japanese farmers used to make it during the winter when farming was not possible. Today, Niigata in Japan is still famous for this product, and it is woven to make fine kimono. Takako shows us the plant, ready for us to split. 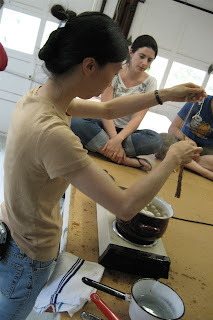 She has soaked small bundles in water to make it easy to handle and turn into yarn. We pull it apart into long strings, as finely as we can get them and make a little pile. 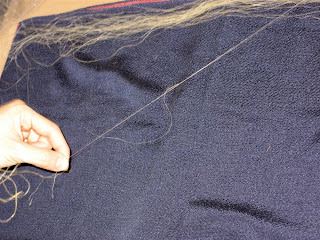 Working against a black cloth so that we can see the fibers, we roll the ends together to create a continuous thread. Takako has given us little plastic buckets, into which we loosely pile our thread. To pass the time, she suggests we relate ghost stories, and many do, allowing us to slip into a kind of timelessness. 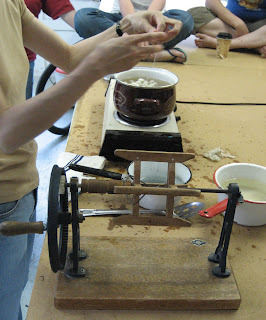 How nice to slow down the pace and think of a time when people could sit together for hours, making yarn. (The stories give me plenty to think about on my way back to the dorm with my little flashlight on the dark road through the forest!) When Takako decides we've made enough ramie, she leads us out of our little cocoon to explore the world of silk reeling. In another room, water has been boiling on a hot plate, into which Takako has dropped some cocoons. 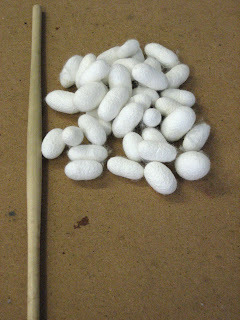 She'll demonstrate how to reel the silk from them, using a little brush to gather the silk from the cocoons. When she first stirs the cocoons, a thick fiber emanates which she noted is also made into a yarn called kibiso, a beautiful rough silk. 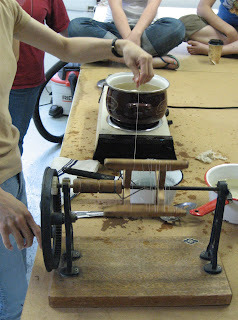 As that fiber diminishes, the finer silk is able to be drawn out and Takako reels it onto a spool, called an itomaki, which fits onto the zakuri, the little silk reeling tool/machine. We take turns reeling the filaments into our hands and onto the reeling fiber. Takako makes it look easy, and I am surprised that the boiling water doesn't cool down much by the time it reaches my hand! 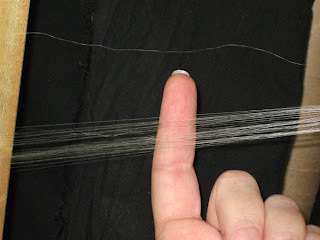 After awhile, the filaments get much finer and more fragile, and I start reeling this silk directly onto a bobbin. It is very restful and pleasant work. 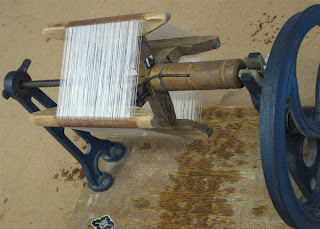 The weaving studio has Macomber looms of varying sizes. 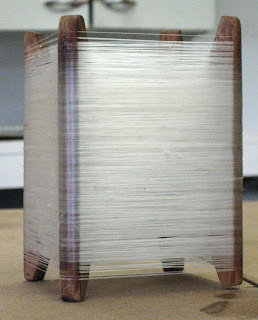 I chose a small floor loom that reminds me of the two harness loom I have at home. 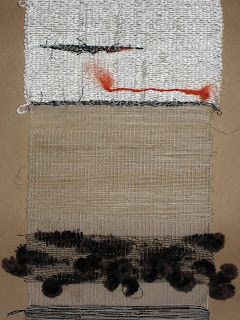 We are each given two spools of 21 denier silk which Takako tells us to try not to see, but feel. It's pretty much invisible, like fine spider webs and it floats. Feeling for it is a good way to locate it. She helps us all, individually, to wind the thread on our warping boards, doing much of the math for us and figuring where the lease and raddle crosses will be. We tape up brown paper behind the boards so that we can see the difference between thread and white wall. Holding two threads together, we follow her instructions to create our warp. We are very quiet while we count or mark numbers on a paper to keep track of how many times we wind our threads around the pegs. 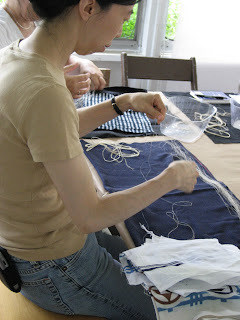 We all have different looms and Takako expertly makes adjustments in warps to accommodate each of us. She repeats her instructions many times so there is little room for error. She shows us all the steps and has us perform them so that we'll be able to recreate the process on our own looms at home. Music, laughter, conversation and some cursing is the background to our carefully threading the heddles. 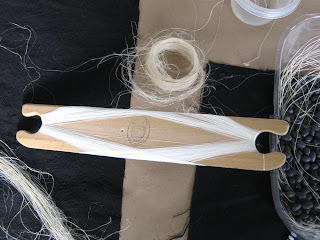 Then our reeds are sleyed with 8 threads in each slot, and waste yarn is woven on to spread the threads evenly. 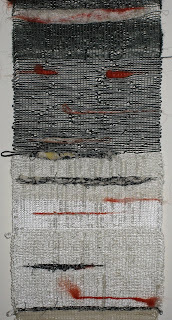 We'll all be doing plain weave. 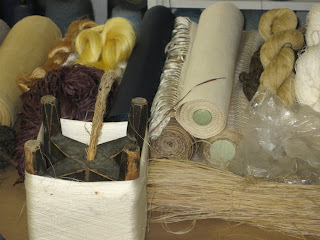 Now we can pick some beautiful Habu threads to weave, along with our reeled silk and hand tied ramie. Up to this point, all of our warps have a very similar appearance. They're gorgeous - about 4 inches wide, a swathe of fine white silk threads. Now, let the variety begin! 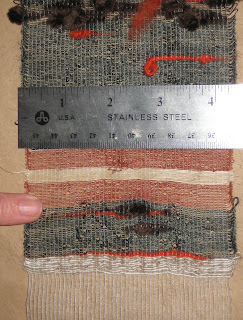 I want to try the warp thread as weft, some ramie and other Habu yarns that strike my fancy, have some fun and just play with the threads as I go along. I wind threads onto bobbins and commence. Takako has brought in narrow shuttles that will easily slide through the shed. We all have a different aesthetic and level of weaving ability, so wandering around the room, we see a great range of what can be done with our fine narrow warp. Some work quickly, some encounter difficulties, and we can learn from all of it as Takako floats around and fixes loom problems, addresses threads that have broken, frustrations that have arisen. Her humor and suggestion that "Sometimes we just need to go the bushes" (to scream and cry) keep us all willing to persevere. When Takako has finished helping us all, she wanders among the rooms, doing her best imitation of a bear lumbering around, just looking for something to do. "I feel like a bear", she says. We all laugh at how our bear talks have influenced her. That doesn't last for long, as we all come up with something with which she can help. 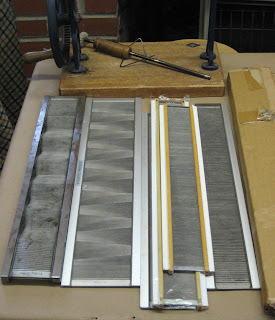 A few people cut off warps, started over, dealt with various loom difficulties. Throughout, Takako was so helpful and encouraging, allowing us all to come up with something that pleased us. She gave us the skills and experience to attempt similar weaving at home. On the last late night of the class, we heard that a bear had been sighted "down by the river". Beth, one of my classmates, had mentioned in one of our many bear discussions, that she'd been advised by a "bear expert" that when confronted directly with one, to punch it in the nose. That conversation had made me, again, start imagining, a little too vividly, standing very close to a bear. Of course, if I'd actually gotten to that point, I'd either already have surprised a bear or not sung badly enough to keep the bear away. Still, I found it hard to keep from thinking about the details of a bear encounter. Would it be on two legs or four? Would I really have the presence of mind to back away slowly? Would it be day or night, and how would that affect the situation? Would I have my trusty flashlight? *Please note that there are way more bears in my imagination than, perhaps, the whole of New Jersey.